LOS ANGELES, Calif. /California Newswire/ — Utelogy 2.0, the latest release from Utelogy Corporation, was selected as an AVTechnology “Best of Show” status at Integrated Systems Europe 2017 convention in Amsterdam this past week. Utelogy is a leader in Software-Defined audiovisual (SDAV) technology for smart classrooms, conference rooms, video-conference rooms and auditoriums. Using an open architecture, the Utelogy platform enables IT departments to incorporate much more enterprise visibility, support, and flexibility into its room technology for easy global control, management and support. With its help-desk and remote monitoring capabilities, Utelogy also delivers data to identify operational savings and use-case data. “Attention to detail, emphasis on the end-user, and breakthrough features made these standout products this year,” said editorial director Margot Douaihy. “With more than 3,000 products on display at the RAI, representing a global pro AV/IT industry, there are exciting developments in networked audio, 4K video, cloud control, connectivity, collaboration, and so much more. Our team weighed the system or product’s uniqueness of the feature-set, perceived value proposition, ease of deployment and use, network impact, and reliability,” added Douaihy. 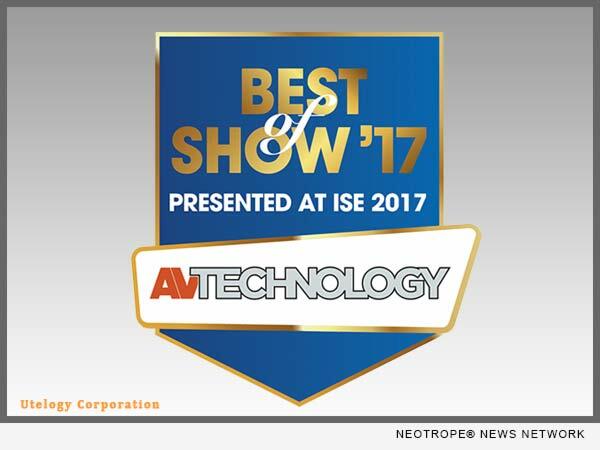 “We’re thrilled to be recognized as an ISE ‘Best of Show’ recipient. This year was the largest show in the event’s history, so it takes some innovation to stand out from the crowd and impress in an industry that is changing every day. We’re also very proud and thankful to all the people on our team,” said Frank Pellkofer, Utelogy’s co-founder and CEO. Utelogy Corporation publishes an enterprise technology control and management platform for higher education, corporations and emergency response centers. Utelogy is a flexible, scalable software solution for control, management, and analytics of AV systems that puts the power in the hands of the user. For more information, visit http://www.utelogy.com/.